^ James Caviezel profile at. Filmreference.com. [2012-05-02]. ^ Parents of actor portraying Jesus in controversial film met in Q-C. Qctimes.com. 2004-02-21 [2012-05-02]. ^ Jim Caviezel. About.com. [2010-06-22]. （原始内容存档于2011-07-07）. One of five children, he grew up as part of a devout Catholic family. ^ James Caviezel (Film and TV actor). Parade. [2011-02-18]. ^ Passion loses realism with its blue-eyed Jesus (commentary). The Virginian Pilot. highbeam.com. [2013-01-20]. （原始内容存档于2012-10-21）. ^ I almost died on the cross - just like Jesus; My Irish mother called acting 'blarney' but..(News). The People (London, England). highbeam.com. [2013-01-20]. （原始内容存档于2012-10-21）. ^ Lee, Luaine. Small-town Boy: Unknown Jim Caviezel Mostly Plays Himself In `The Thin Red Line'. Chicago Tribune. Knight-Ridder/Tribune. January 21, 1999. ^ Jim Caviezel. Encyclopedia of World Biography. [April 7, 2012]. ^ 'Passion' Filming Takes a Toll on Jim Caviezel. FOX News. December 1, 2011 [December 22, 2011]. （原始内容存档于2012-08-04）. ^ Jim Caviezel: 'Playing Jesus Christ cost me my acting career'. SFGate.com. May 3, 2011. ^ Zakarin, Jordan. Jim Caviezel: 'Rejected By My Own Industry' For 'Passion Of The Christ'. Huffingtonpost.com. May 2, 2011 [2012-05-02]. ^ Kwon, Lillian. "Jim Caviezel Back as Jesus in New Audio Bible", The Christian Post, December 26, 2006; accessed June 10, 2008. ^ The Official Word of Promise Audio Bible Website. Thewordofpromise.com. [2012-05-02]. ^ Ian McKellen cast in The Prisoner. BBC News. July 1, 2008. ^ Prisoner series set for remake. The Scotsman (Edinburgh). July 1, 2008. ^ TV's 100 Sexiest Men of 2011. BuddyTV. [March 9, 2012]. 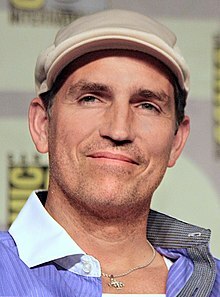 ^ Actor Jim Caviezel Announces Son's Terminal Cancer. First Active Media. [December 14, 2012]. ^ About Scott Linehan. [October 21, 2012]. ^ Sydlik, Ryan. "Caviezel takes Notre Dame course" 互联网档案馆的存檔，存档日期2007-10-13., The Observer, August 31, 2006; accessed June 10, 2008. ^ Response to Michael J. Fox ad. Youtube.com. [2012-05-02]. ^ used vs. stem-cell initiative[永久失效連結], The Washington Times, October 25, 2006. Accessed June 10, 2008. ^ Jim Caviezel's Federal Campaign Contribution Report. newsmeat.com. （原始内容存档于2013-01-17）.